Spectacularly talented, hard-nosed heir to a German spice fortune, Jochen Rindt burst onto the international racing scene when he won the 1964 London Trophy for F2 cars at Crystal Palace driving his own private Brabham-Ford. 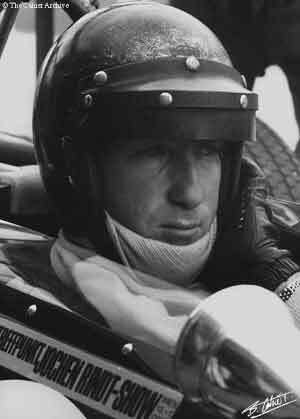 By beating the likes of Graham Hill, Jim Clark and Denny Hulme in this prestige second division event, the confident Rindt propelled himself into the Grand Prix milieu. The following year he signed for the Cooper works team, but although his three year stint with them produced much promise and dramatic driving, no wins came his way. In 1968 Jochen switched to the Brabham-Repco squad, but his season was blighted by technical problems. As a result, for 1969 he moved to Colin Chapman's Lotus team, effectively assuming the mantle of the late Jim Clark. Rindt stormed to his first GP win in the US race at the end of 1969 then started his '70 Championship charge with a dramatic last corner win at Monaco. Thereafter armed with the sensational Lotus 72, he won four more Grands Prix before being killed in practice for the Italian race at Monza. He became motor racing's first posthumous World Champion.